In 1986 a medieval pottery kiln was excavated at Pund Lane, Canterbury which appears to have been worked by a continental potter, perhaps a Norman, around the middle of the 12th century. The report contains a short account of the site and excavation, followed by a detailed account of the kiln itself and an extensive typology of the kiln products. 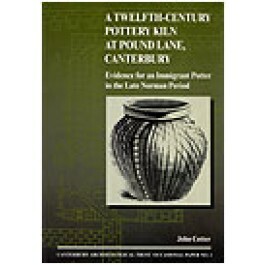 The local, English and European contexts of the Ound Lane industry are examined and an attempt is made to define the likely homeland of the immigrant potter.